If you have fond memories of the cheesy cop shows from the 70s, 80s, and 90s, this movie may make you reassess them. 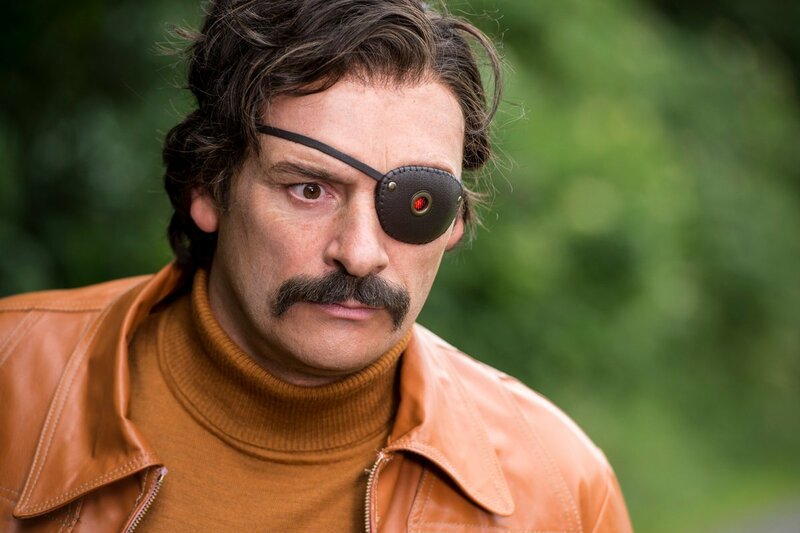 Julian Barratt plays Richard Thorncroft, best known for playing Isle of Man-based TV detective, Mindhorn, a quarter of a century ago. Unfortunately, some dodgy chat-show appearances, and changing tastes, mean that his halcyon days are long behind him, and he has been reduced to appearing in commercials for socks! Like so many of these former TV icons though, he still has at least one obsessed fan. Unfortunately for Richard, said fan ‘the Kestrel’ is wanted for murder, and will only talk to Mindhorn, whom he believes to be real. Cue Richard reprising his most famous role, in order to help the police, and raise his profile once more, but he soon finds himself in over his head, and trying to solve a crime for real. Barratt is best known for his work with The Mighty Boosh, and the surrealism is very much in evidence here. This doesn’t take itself very seriously, and it would be a mistake for a viewer to do so. There are lots of campy flashbacks and clips, and the influence of numerous cheesy TV shows from the 70s, 80s, and 90s, is very evident. Richard is stuck in a time-warp, unable to accept that his best days are behind him, and desperately trying to cling on to his leading-man status, courtesy of a hairpiece and a girdle. This leads to all sorts of nonsensical situations as he embraces his iconic role once more, oblivious to the fact that there are no cameras rolling. Barratt doesn’t play it for laughs, and takes it very seriously, which works wonderfully. He is ably supported by a wealth of well-known British talent, including hilarious cameos from Simon Callow and Kenneth Branagh. It embraces every single show business and actor cliché you can imagine, and it does have plenty of laugh out loud moments. However, at times – even by the standards laid down here – it does go somewhat OTT. Farnaby is an absolute caricature as Thorcroft’s stunt-double, and there is a parade scene set on Isle of Man day that is far less slapstick than it thinks. This is an unashamed cheesefest that owes much to the easily-parodied shows of yesteryear. At 83 minutes it doesn’t outstay its welcome – if anything it feels like it ends rather abruptly. But there is enough humour in it to entertain most viewers. Not a modern classic by any means, and might have worked better as a TV show (a TV show within a TV show even) but all in all, it is good fun.